This solitaire is a riff off of my classic Low-Profile solitaire, but built for a slightly larger sparkle (~1.5ct). 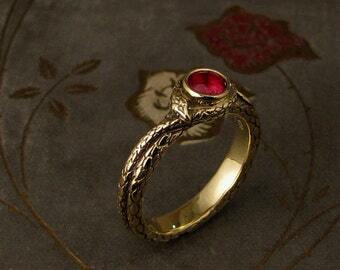 I wanted this ring to be sturdy and capable, but still have a little something-something special going on. I have always LOVED Art Deco design, and feel like the light faceting I carved in makes for a more svelte and sleek design. I'm pretty excited about this one! The stone is bezel-set nice and low for comfort and functionality. 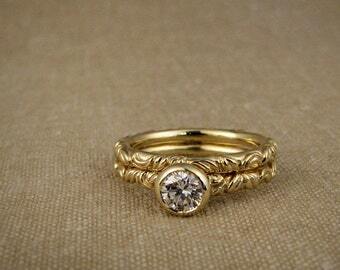 The subtle geometric framing about the ring makes this piece both old-style and yet very modern. 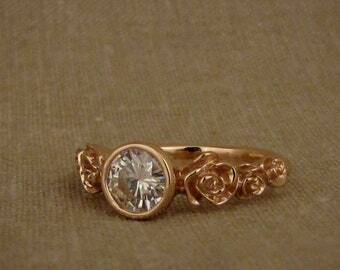 This ring is priced for the mounting in 14K gold only (white, yellow, or rose gold) and does not include the diamond. You may select your perfect stone, be it diamond or something with a little color, or perhaps you have a family diamond you would like to use... Send me a note and I'll get you all the info you need! Also, hit me up if you need a quote for 18K, platinum, or palladium. 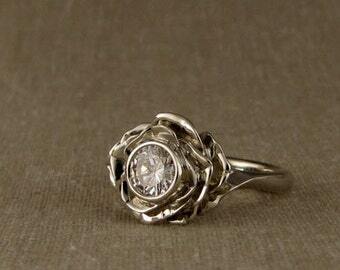 This ring is priced WITHOUT the diamond shown in the photo. You choose a stone to match your taste and budget (or feel free to send me a stone you already have). I am happy to help you search for and select a classic brilliant-cut diamond, or an antique Old European-cut diamond, colored stone such as sapphire, moissanite, etc. Contact me for specific pricing. 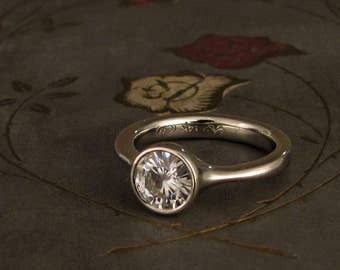 The ring is made to accommodate a stone that measures approximately 7.5mm in diameter, or roughly 1.5 carats. All diamonds I use are Kimberly Process guaranteed (conflict-free certified) OR recycled completely (i.e., removed from older jewelry, cleaned, sorted, and graded). 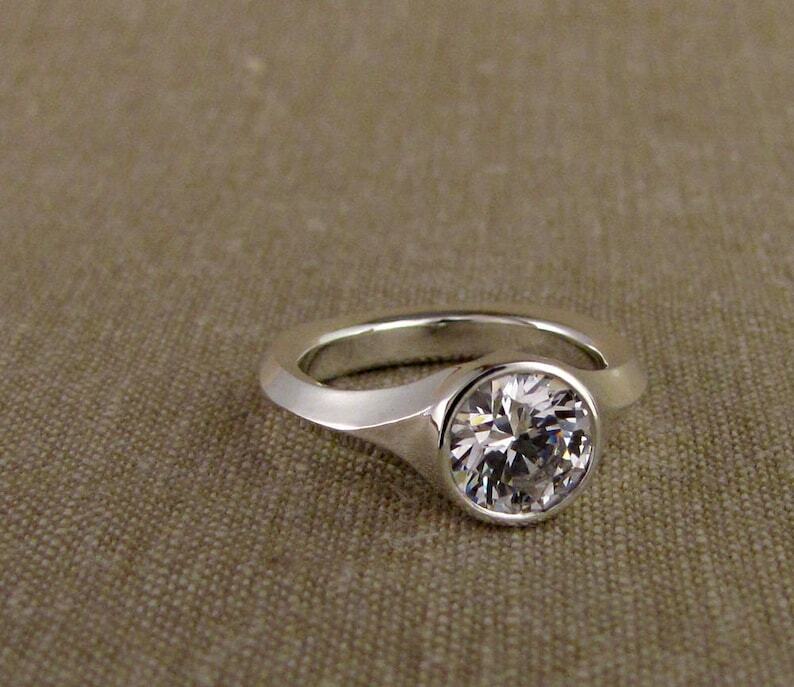 It is securely bezel set in the ring, a very clean looking and understated setting. Diamonds come with a grading report from GIA. MOISSANITE: I use only Forever One moissanite, by Charles & Colvard, "colorless" or "near-colorless." This ring is hand carved in wax by me using pointy tools and then cast using the lost-wax method. * Custom pieces take around 1 month to make (I will let you know the timeline via email). If you have a pending wedding, let me know and we'll figure something out! * I ship USPS Priority (Priority Express if item is >$1500-ish), fully insured. ** YES - I DO SHIP INTERNATIONALLY! Please convo me for a quote to your country. I have listed ~$40-60 as a rough average, but I'll calculate the costs to ship insured to your specific country and charge you a more exact amount. *** PACKAGING: All pieces come in a lined jewelry box with a description card and care instructions; this is packed w/padding tissue inside a sturdy cardboard mailer. I ship flat rate padded plastic envelopes USPS Priority or Priority Express, always fully insured. Cheyenne’s talent is so awesome! 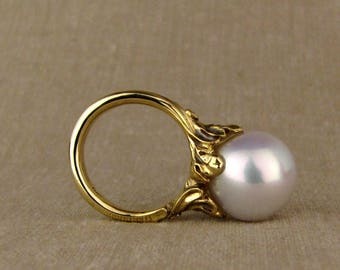 I love my custom ring with an ocean wave beach shell vibe in a rococo style. Thank you! Wow! Cheyenne knocked this ring out so beautifully! I asked for a rococo style with a shell and scroll like carvings to mimic the ocean waves and she created the most perfect ring! Excellent communication, pics and letting me know progress. amazing talent!!! Fast shipping! Will be back for more pieces. ❤️ it! Thank you! Love, love, love my new wedding band. The carving is detailed and crisp. I got to approve the wax carving before the ring was cast. Thrilled with the attention and care I was given and the excellent communication. 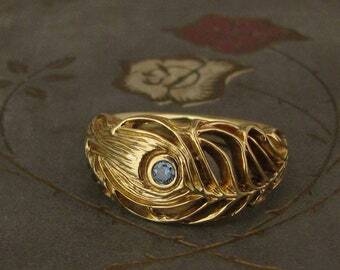 Beautiful, heirloom ring! * Etsy allows credit card payment! Woot! * Personal checks! Keep in mind that with checks, I wait for it to clear the bank before shipping. I will accept returns for non-custom pieces (i.e., pieces that I already had made) if you contact me within 7 days of receipt & return ship within 14. You will need to contact me ASAP and then return the item (at your expense) to me in the original packaging and in original condition with no notable signs of wear. I can issue either a full refund (minus shipping) or credit for another piece in the shop. Custom items can be returned for a 30-50% refund (minus shipping) or credit for another piece in the shop. This weird range is due to the type of piece: A shop design is more like 50% refundable. A fully custom design and original carving will be less. Also, depending upon the piece, stones (expensive diamonds? small accent stones? something you send me?) can vary wildly in price and so these need to be taken on a case-by-case basis. Again, contact me ASAP if you need to do this, and again, the item must be returned at your expense in original condition and in original packaging. Really though, let's just not let this happen. Feel free to ask me all the questions you have in advance, let me know your concerns. I will send you photos of every step of the way (sketches, wax images, etc.) and when something starts to not look right, you will have ample opportunity to let me know so we can fix it. From time to time, this shop offers donations to charitable organizations with a purchase (will be very plainly stated--do not fear: you WILL know about it). Just keep in mind that any donations made to a charitable organization will not be refunded in the event that a piece needs to be returned. I ship ready-to-wear items within three days of receipt of payment. Multiple items may be shipped together (simply calculate total insurance cost). Contact me if you have special shipping instructions. Otherwise, I will ship to the address in your Etsy profile. I DO ship internationally; I just do not have exact rates listed in my purchase section because of the wide variety of pricing and insurance depending upon where the item is shipped + how much insurance I need to purchase. Just convo me with your address and I'll give you a shipping quote. Very generally, it's around $40-65. I ship USPS Registered mail + insurance. I ship USPS Priority (2-3 days) or Express (1-2), fully insured. Typically, I ship Priority Express only if the value is greater than $1500, but you can absolutely request an upgrade if you are in a rush. All pieces are sent out in lined jewelry boxes (which usually have their own cute little box) and come with a description card + care instructions. These are then carefully packed with padding inside a protective cardboard to protect the lot from the wilds of the Postal Services. A box in a box in a box. Yay! I hate to have to do it but I get a lot of requests for rush orders and I'm finding it increasingly difficult to accommodate them with my current workload. Therefore, if you need to rush your order, I'll charge between $125-$175 additional for fully custom designed/carved orders and $75-$100 for the pieces listed in my Etsy shop. The range in price is because my workload can fluctuate quite a bit. Thank you for understanding! 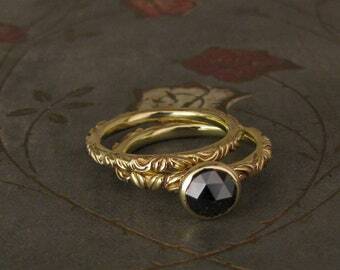 When ordering a ring to be made to size, please be absolutely sure you have the correct ring size. Go to a jewelry store and have them measure your finger using both a narrow measuring ring and a wide ring (or corresponding to the approx. width of the ring I'm making you). Having both gives me a better idea of the shape of your finger. Be sure to take into account how your fingers feel that day; i.e., the temperature at the time of sizing (your fingers can swell a little during warmer weather, shrink during cold dry weather--if you wear rings normally you probably have a good sense of whether you are having an average finger-size day). 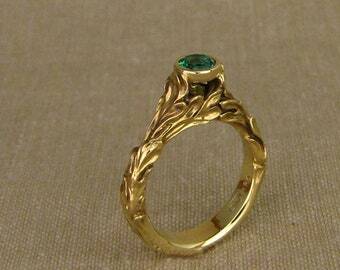 If the ring has carved detail all the way around, it is not as easily re-sized once finished. However, if the bottom is smooth, it's probably not a big deal if you need to resize it. Don't worry if you are between sizes; just let me know all details that seem pertinent and I'll make it to fit. Two options I can think of: Select a ring they wear on that SAME finger (if they have one; dominant hand fingers are generally a little bigger in size). You could either bring it into a jewelry shop to get the size, or you could buy this cheapy ring mandrel from amazon.com: http://tinyurl.com/7h2yorx (in case they don't often go without it or would notice if it were missing for any period). Slip the ring on the mandrel and note the size; just make sure it is a nice snug fit. Best is to also send me the mandrel to calibrate sizing on my end; there can be some variation in plastic mandrels. Or, the more dramatic option (one of my clients successfully did this! ): enlist the help of one of their friends to take them shopping and stop by a jewelry shop on the pretense that the friend wants to be sized for whatever reason. The friend then needs to convince your fiance-to-be to try on the sizers too "just because" and the friend can later tell you their size.